Approximately 2.5 miles in length, the Music Bend Nature Trail snakes through the wooded area along Mud Creek and marks the spot young Elvis Presley used to swim. It's located in east Tupelo with two entrances on Veterans Boulevard - one at the dog park; the other across from the fire station. If you haven't visited this "hidden" gem in our community, now is the time. Join us as we cleanup the Music Bend Nature Trail and plant additional native species shrubs and trees (plants that are indigenous to our area) along the trail. Thank you to Bob Marion and our friends at Mid-South Nursery for making this day possible. And to Design By Tracy Proctor, LLC for his enthusiasm and guidance. 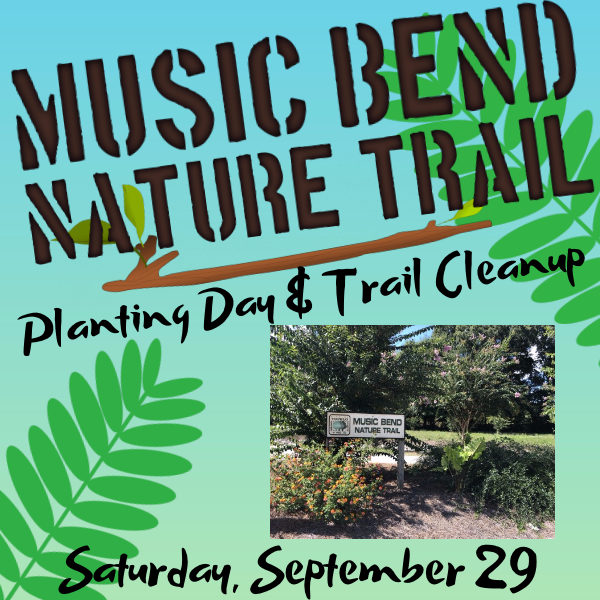 Bring a shovel to plant native species shrubs and cleanup the Music Bend Nature Trail near the Tupelo Bark Park! Log in to see who is volunteering for Music Bend Nature Trail Planting Day & Trail Cleanup!